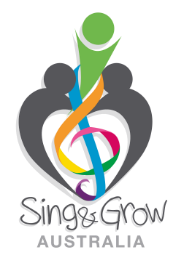 Here are some fun songs from our old CD "Sing & Grow Together" (no longer available for purchase) for you to enjoy with your children. Happy Music Making! Where's Your Nose? is a fun, interactive body part & action song. Sit facing your child/ren and sing along, encouraging your child to touch their nose/ ears/ eyes along with the song. Try singing "Touch my nose" and have some fun with noises like "Honk Honk". Clap hands, stamp feet and pat knees along to the song. Enjoy! Are You Ready for Music? is fun action song. Face your child/ren swaying side to side with the music. Follow the actions suggested on the track and then make up your own. Don't forget to get up and dance if the music takes you! Bee Hive Song is a great song to encourage fine motor skills. Facing your child/ren start with one hand closed to make a fist. Fingers come out one by one as the 'bees' appear. Don't forget to end the song with some tickles together during the 'buzz buzz buzz' section. I am a Fine Musician is a traditional song that encourages making some noise. 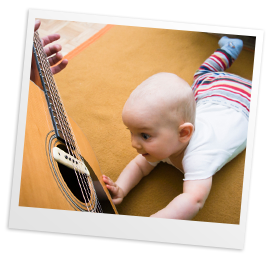 Grab some pots and pans or toy instruments and play along to the song together. Have some fun trying soft and loud, fast and slow. Dance around the room pretending to be in a marching band!